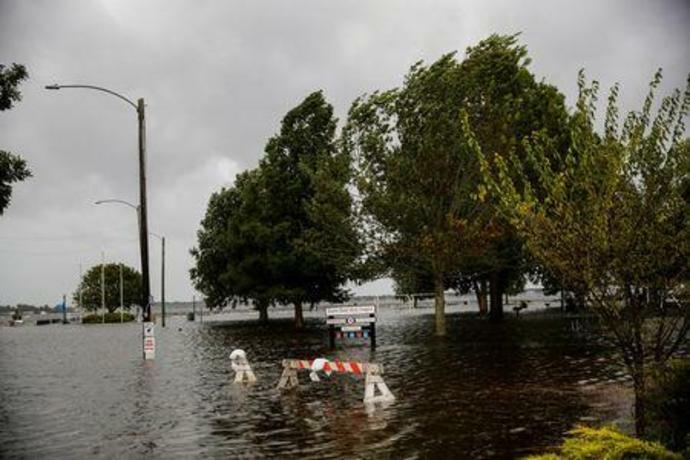 The sheer size of the storm meant it could batter the U.S. East Coast with hurricane-force winds for nearly a full day, according to weather forecasters. North Carolinians made last-minute preparations and hunkered down to await Florence's arrival. In downtown Wilmington, a few hearty locals gathered at Cape Fear Wine and Beer pub. "We lost power at home so we figured we should come to the bar," said Carla Mahaffee, a 33-year-old actor from Wilmington, as she drank a cider. "We've prepared all our supplies at home and frankly, we were bored." "It's not the middle of a hurricane yet, so why not come for a beer?" said Waters, 54. The storm's center was about 85 miles east-southeast of Wilmington at around 8 p.m. EST. Near the beach in Wilmington, a Waffle House restaurant, part of a chain with a reputation for staying open during disasters, had no plans to close, even if power is lost, and on Thursday evening there were lines to get in.